Twitter’s business model (or rather lack of one) is a topic of endless debate. Like many successful startups that came before it the company has been successful in getting users and usage when it doesn’t charge a cent. But ramping up revenue is a different matter. And Twitter is now in the process of doing just that. Most startups in this position simply sell themselves before it becomes too much of a problem and let their new parent deal with it (see YouTube). A nice side benefit of having no revenue is that the MBAs can’t use your actual financials to determine your valuation. Twitter is likely to do the same, but these uncertain financial times mean Twitter can’t count on a definite exit anytime soon (although I’d bet money Google buys them within six months). But now’s obviously the time. 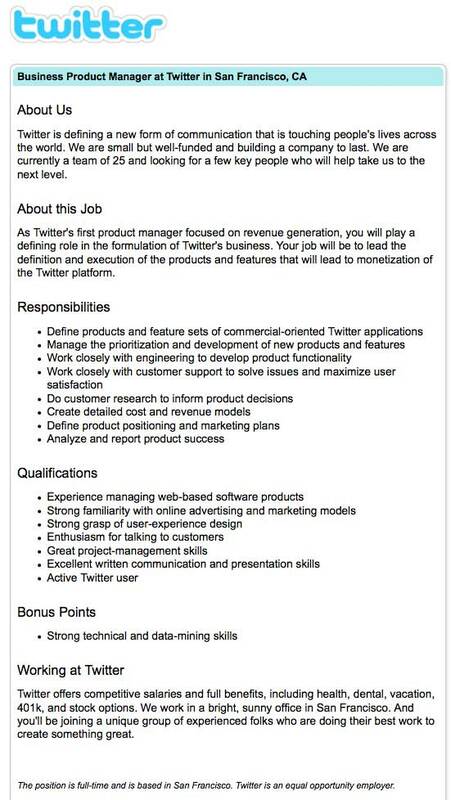 Twitter recently posted a Product Manager job description at Jobscore. Got an idea as to how Twitter can turn on the cash spigot? Send in your resume.